To avoid this unpleasant scenario, many brand owners and their molders are choosing to work directly with color companies. By bringing them into the product design process early, color specialists can assist in formulating colors in any number of resins to ensure that both the aesthetic value and packaging performance expectations remain paramount. Below are just a few of the basics for specifying the best color and resins for plastic products. Choosing colors for your products is an exciting part of the development cycle. There is a lot of information available for designers looking for ideas or trends. These include Pantone, paint companies, magazines, social media (Pinterest, Instagram) and more. For those designers preferring to avoid trends and step out boldly, there are great resources available in some fairly unique places like one we discovered, the Baxter Mill Archive in Rock Hill, SC. That resource describes itself this way: "We believe every piece in our collection has a unique story to tell, whether they come from a Parisian art house in the early 1900s or from a remote village in the Guatemalan countryside. Our passion is bringing the archives back to life, giving them fresh purpose for today's market." One of the most important factors to keep in mind when designing a plastic product is that the resin and color concentrate must be suitable for the process, be it injection, blow, extrusion, or compression. Resins, pigments, dyes, and additives must be able to withstand the extreme heat they are exposed to during the molding process. This includes shear heat, which is generated when material is injected into a mold. The materials must also be suitable for its environment. For example, if the product is a robotic lawn mower, Jet Ski, or ATV, the resin has to be a very durable to prevent unexpected failure during incidental impacts and must include ultra-violet and anti-oxidant additives. These additives protect against polymer degradation, which ultimately leads to color failure. Knowing the environment and performance expectations can lead designers toward a particular color space while avoiding others. For instance, yellows and reds tend not to perform well in intense outdoor climates. That said, there are specific pigments with unique coatings and finishes that allow color companies to effectively formulate reds and yellows for solid outdoor performance. As long as specifications and expectations are clearly outlined at the outset, more often than not, a solution can be provided. The next decision is to choose your color technology. The two most widely available choices are pre-color and masterbatches in either liquid or pellet form. Pre-color is easier to use, since the color is already in the resin the convertor is using to mold a finished part. But it can be expensive, and for large parts or extensive runs it can require maintaining considerable inventory on hand as compounders often require high minimum orders. There is always a looming threat that the product being produced might reach the end of its sales cycle before a pre-color order is fully consumed. With technological advances in dosing equipment, masterbatches (pellet or liquid) have proven a lower cost option, but many processors still debate whether liquid or pellet masterbatch is the better option. Both methods have advantages and disadvantages. The advantages of liquid color masterbatch include: effectiveness at extremely low levels, good on long production runs, newer computer-controlled pumps offer consistent delivery, and upfront costs can be lower. The challenges of using liquid color masterbatch are: liquid can cause screw slippage when higher levels of additives are required, liquid carrier resin can separate from the color itself over time, requiring offline mixing or peripheral online equipment like agitators and housekeeping issues present a challenge due to the constant threat of equipment malfunctions of hoses and tube sets due to wear and tear. In addition, the drums/pails used to ship/store the liquid color will need to be returned to the manufacturer or disposed of in a landfill. This cost for disposal and shipping increases the overall cost for the part and represents a negative impact on the environment. The ability to dose pellet masterbatch with absolute precision is a perfect complement for injection molding and extrusion customers looking to reduce their operating costs. For more information about LIAD, contact U.S. Distributor Chroma Color Corporation. The advantages of pellet color masterbatch for plastic parts include: reduced housekeeping, zero waste, and quick changeovers. Lastly, it avoids hidden costs like additional hoses and tubes sets, agitation, and the consolidation that liquid color requires. When liquid color was introduced in the 1980s, it quickly gained notoriety as the lowest cost option for coloring plastics. However, this historical advantage has been challenged lately by new pellet technology that can both reduce cost and eliminate processing headaches. One such option is G2 and G3 patented colorants. These pelletized colorant technologies feature the highest loaded pigment, dye, and/or additive packages in the industry. The colorant is exceptionally well dispersed and is effectively distributed in large and small parts at a reduced cost. These options offer some sustainability benefits as well, such as: three truckloads of conventional concentrate can be replaced by one truckload of Chroma Color's G3, while lowering converters' cost by 15 to 20 percent. To learn more about these products, click here. Currently, there is a great need to offer recyclable or biodegradable plastic products. There are options for resins and additives made from renewable resources and stabilizers to promote recycling while preserving the physical properties, etc. You will need to work with your concentrate supplier to determine your best options to accomplish your goal. A great way to learn more is to visit the Plastic Industry Association website. It has good articles, infographics, and interactive quizzes to help your family, friends, neighbors, customers, and the world understand the importance of plastics. Click here to visit the site. 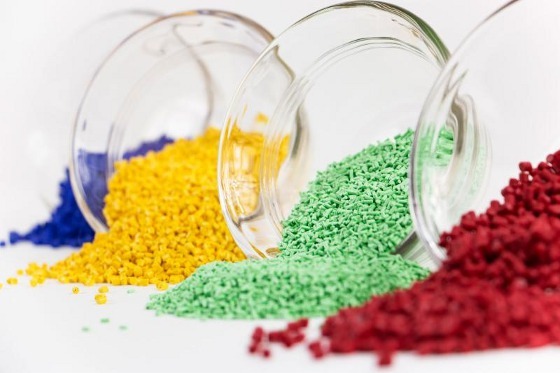 Our expert polymer and color engineers are independent and unbiased as they select from over 50 engineering resins and hundreds of pigments, additives, and modifying additives to tailor a thermoplastic concentrate to meet your specific end-use requirements. Our specialty concentrates can provide multi-property solutions in a single material, reducing manufacturing cost and speed to market, while providing the freedom necessary for product designers and engineers to realize their vision for applications spanning every major market segment.